When I heard around a month ago that there was a ‘wedding’ album due out to promote a relatively new orchestra, my reaction was (and I quote,) “eh”. But then, the very next night, I went to a chasuna at which the Nagila Orchestra played. I was, to say the least, wowed; the music was so impressive that I was ‘on a high’ for three days after. 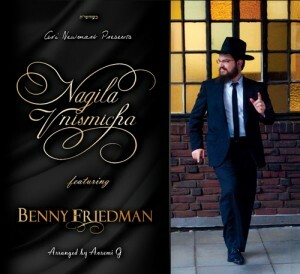 So needless to say, I was greatly anticipating the release of Avi Newmark’s Nagila V’nismicha, featuring the Nagila Orchestra, with Benny Friedman singing. This album is not like any other wedding album you’ve ever heard. The only thing ‘weddingish’ about it is the way the songs are broken up- Room Opener, First Dance, Second Dance, etc. As a whole, this album features solid musical arrangements through and through, as well as superb vocals (as we’ve come to expect from Benny Friedman). Personally I’m still scratching my head over the song selections for this album, but I must say, these songs to do quite a good job of showing off Benny Friedman’s voice. Also, I like the fact that this album does not have an abundance of Benny Friedman songs. (They were/are good, but too many on the same album again would be overkill.) Another thing that I liked about the way this album is arranged is that rather than squeezing in 35 songs at around 90 seconds per song, here they’ve opted to only put in 18 songs with closer to 3 minutes per song (plus 2 brand new, full-length songs). Excluding the two original songs, each track is paired with its own intro aside from the intro with which it was originally recorded (AKApella style). As a promotion for a new orchestra, this definitely settles any worries that you may have of whether or not this group can play ‘contemporary’ intros. Considering that I didn’t get the feel that most of these intros were written for their respective songs, (they blended nicely, but didn’t always leave the feel of ‘wow these were made to be played together’,) it would have been nicer to hear more Shwekey and Gabay, and less, um, alternate genre artists. Nevertheless, each and every track flows perfectly and this album was a pleasure to listen to. Sameach– Starting off the album is one of the two new songs, Sameach. Composed by Elimelech Blumstein, and featuring the Moshe Roth Choir, this song is a great way to start off an album. Especially considering that the words fit in perfectly for a wedding, don’t be surprised if this song is incorporated into the repertoire of second dance songs by many orchestras as early as the end of this month. Plus, this song has the words Nagila V’nismicha in it. Room Opener– The ‘wedding album’ theme goes around as far as the title to this track. Although the songs that are used are not typical ‘wedding songs’, they still demonstrate the musical talents of this orchestra. I must say, I was happy to hear Benny singing his hit No Lyrics again. It’s a shame that they haven’t been playing this song more frequently by weddings (at least not at weddings that I’ve been to). Also played in this group of songs is Gevald, a song originally from MBD’s Efshar L’takein album. Benny does a great job with this song. I also like how the intro from the beginning of the ‘dance’ is incorporated in other songs, not just the first. First Dance– As is common at weddings these days, the First Dance has not only one, but TWO intros. At first I was rather surprised- MP3 only just came out two weeks ago, yet the high part to the English song is already being used as an intro on Nagila V’nismicha?! Then a friend of mine recognized it as part of a song they play before Yankees games….I guess the Yankees are popular in the Jewish Music world. Anyway, back to the songs themselves, First Dance begins with one of the two yehoreig v’lo ya’avors of Chasunas these days- Ashreichem. I doubt there has been a litvish wedding in the past three months at which they did not play this song. It’s a solid freilach with a pumping high part, a guaranteed pleaser. Good job by Benny Friedman in the intro used for Reb Yid, although I think it may have sounded better had the vocal fade been stretched out a bit longer. (But hey, there’s a reason why THEY get paid to do this and not me :) .) De Zeides is a good song that strikes me as a cross of the Marvelous Middos Machine’s Never Take Your Kids To A Store song, and an old Tzlil V’zemer Maccabee song. And on we go. Mehaira– Mehaira is the second and last original song on Nagila V’nismicha. It was composed by Mendy Fisch and features Yitzy Spinner as the adult choir, as well as Benjamin Newmark as the child soloist. Don’t be surprised if you hear this song played during the meal of chasunas in the near future, as it is a very nice song. Mendy seems to have a lot of talent as a composer, so keep your eyes (and ears) open for more of his songs! Second Dance– The second dance is where the song selection of the performing band counts the most, as for some reason the people on the dance floor seem to need more motivation to dance then. That’s where songs like Libi Bamizrach come in clutch. It’s a fun, Sfardi styled song that really gets you moving. I especially liked the tribute to Mendy Wald’s Sameach shtupped in at 1:13; halevai that there were more! ) I was also pleased to hear Shloime Gertner’s Ashrei Mi included in this group of songs. Sameach is squeezed into this track as well, at 2:13. The dance ends nicely with Benny’s own Moshiach, which is paired with Taio Cruz’s very popular Dynamite. Ten More Minutes– We are now up to the final part of the album, which features songs of the genre that one tends to hear at the end of the second dance. First up is Benny Friedman’s Taamu. I particularly like how the band really seems to ‘get into’ these songs; it gives it more of a ‘live’ feel that you don’t tend to hear on recorded albums. The next song is the other yehoreig v’lo ya’avor of Chasunas these days- Ki Hirbaisa. I was actually at a wedding recently at which they did NOT play this song…that resulted in the forty bochurim there singing it in unison after the band stopped playing. Yes it’s very popular, and for good reason; just hear for yourself. Next up is the well-known One Day, originally sung by Mattisyahu. I don’t know if you saw the YouTube video going around over the summer of Benny Friedman singing this song, but he really makes this song sound like it was written specifically for him to sing. It’s a very good combination to have as the album nears its end. I agree this album is a lot of fun to listen to. Just curious was Yaron Gershovsky playing at that wedding you heard? Avrumi G did a great job on arrangements but people should realize the musicians on this album will most likely not be playing at their wedding (unless they have a lot of money to spare). Actually this wedding had yitzy spinner and aryeh kunstler so yes the talent was there, but a large part of the credit for what you hear goes to Avi Newmark (who I’ve heard is there in person for each time the band plays) and Ian Freitor who does the sound. Yes, he was also at that wedding. Well my point is important but your point is he only hires quality musicians which I can appreciate. Shloime Cohen, who plays on the album, was also at that wedding, btw. Gal Gershovsky was supposed to be there but couldn’t make it. Eran Asias pinch hit for him. They were all awesome. Anyone have any other questions, feel free to let me know. It was my kid’s wedding. The music and equally important the sound, were incredible. Does anybody recognize the intro to no lyrics??? I suggest everyone to listen this album because this album is full of fun.they were awesome.Thanks! Did anyone notice that the intro to “der zeides” is a wild rendition of Moshe Yess’s My Zaidy? Right band, wrong song. It’s “Africa” by Toto. Oops…my bad! Thanx for correcting me. and the obvious – Coldplay’s song “Viva La Vida” as intro for track 8?